Saturday June 21st 1884. It was a fearful warm day. I worked out in the garden some. Em Weldie and Roy were here to spend the day I worked some on the shawl and after supper pulled weeds in the garden again Will came from Dubuque. 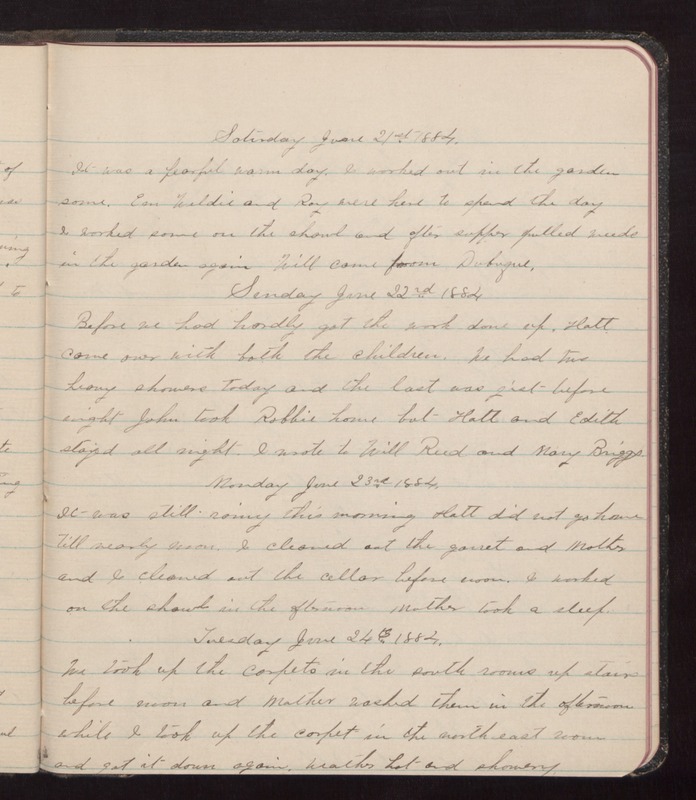 Sunday June 22nd 1884 Before we had hardly got the work done up, Hatt came over with both the children. We had two heavy showers today and the last was just before night John took Robbie home but Hatt and Edith stayed all night. I wrote to Will Reed and Mary Briggs. Monday June 23rd 1884. It was still rainy this morning Hatt did not go home till nearly noon. I cleaned out the garret and Mother and I cleaned out the cellar before noon. I worked on the shawl in the afternoon Mother took a sleep. Tuesday June 24th 1884. We took up the carpets in the south rooms up stairs before noon and Mother washed them in the afternoon while I took up the carpet in the north east room and got it down again. Weather hot and showery.